Integrate Microsoft Outlook into your office productivity. Securely archive incoming and outgoing email while automatically triggering new workflow tasks. Key search views are embedded directly in the Outlook for single-screen productivity. DocuWare integrates seamlessly into Outlook. You can store or search for email in the DocuWare ribbon or via context menus. 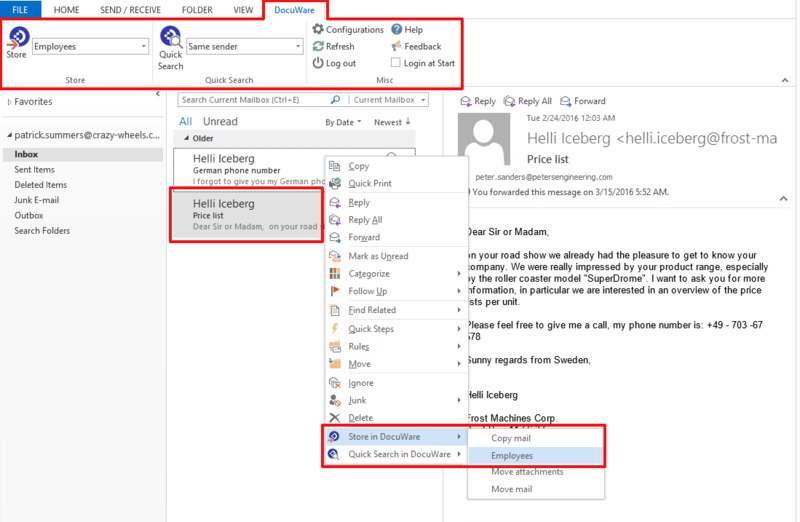 Archived email from Microsoft Outlook can be managed together with other document types. This improves the organization of related content, such as project documentation, customer correspondence or transactional data. Email can be retrieved from the file cabinet together with other business-relevant documents. Treat email as business-relevant documents with regard to legal requirements. All DocuWare functions can be accessed directly in Outlook. Once archived, email messages are available to colleagues with sufficient authorization.